The holidays are here again, and if you’re like many pet owners, you want to give your pup a gift. But not just any gift. You want to give your dog a gift that he’ll love, and you’ll use. 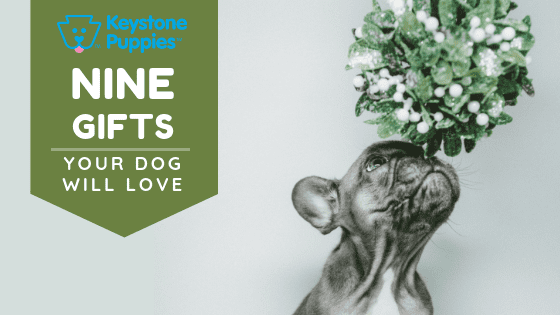 That’s why Keystone Puppies has developed this list of the nine best puppy gifts for 2019. Grooming gloves are a great way to brush your dog AND pet him at the same time. These gloves may have five fingers or look like an oven mitt, but one side should be covered with soft, plastic bristles that allow you to groom while also giving your dog a relaxing massage. You might find that grooming with gloves becomes one your puppy’s favorite activities. 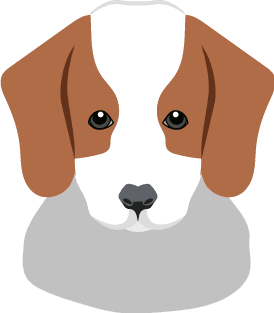 Dogs love to chew, and if you don’t give them an outlet for this instinct, they may choose one a chew toy of their own (like your shoe or a retainer.) Big dogs will need sturdy bones or big rawhides. Little dogs may be satisfied with hard biscuits. But whatever you choose, remember that your pup will eventually chew it to bits, so you might not want to spend a lot on this item. If you live in an area with snow or ice, your dog’s paws are going to get hard bits stuck between his pads during winter walks. Whether it’s icy shards, rock salt, or packed snow, these cold, hard, chips can cause dogs real discomfort in the winter. Paw wax for dogs is an inexpensive way to protect your dog’s paw pads from minor abrasions. And since it’s a waxy balm, it’s as easy to apply as lip balm. While chew toys are great to help satisfy a dog’s need to gnaw, tasty treats are also a great holiday gift idea. In addition to the standard boxed variety, the holidays may give you an excuse to visit a local dog bakery, or even bake some treats of your own. For good dog treat recipes, check out this pet recipe collection from Good Housekeeping. Plush toys satisfy a dog’s need to hunt and fetch. While some dogs snuggle with plush toys, other prefer to toss them about and destroy them. Once you figure out which type of dog you have, you can figure out which budget makes the most sense for you. Snuggler pups can get more expensive plush toys, while you may want to stick to cheap throwaways for destroyer dogs. Have you ever tried to massage on your dog? It’s more complicated than petting, and it’s a great way to spend time with a dog that needs to be calmed down. It’s also a way to help dogs with sore joints, and give focused attention to breeds that need more one-on-one time. If you’ve never tried it, check out a few YouTube videos to see if dog massage is for you. And if you find that your dog benefits from massage time, invest in books and DVDs for more advanced courses. Does your dog love to play fetch? Is your old tennis ball flat, sticky, or smelly? Then a new can of tennis balls might be the perfect holiday gift for your canine pal. Don’t buy too many at once, since tennis balls lose bounce over time. Tug is a great indoor activity for large and small dogs. Invest in a sturdy tug tog, sized for your dog. Make sure your tug toy provides your pup with stretch and pull they need. Investing in a tug with an easy-to-grasp handle means that you will be able to give your dog a workout without getting sore joints. If you haven’t tried a game of “chase the laser” with your pup, you’re missing out on great indoor fun. Small red laser lights or pen are inexpensive, but dogs (and cats) can’t resist chasing them. When choosing laser lights or pens, get a small, weak beam. Keep the light away from pet and people eyes. Never shine the light directly at your pup’s eyes. And be forewarned: some dogs get extremely excited when chasing laser lights, so you may want to start slow to see how much your dog can handle. Keystone Puppies cares about your pet. Toys and treats are more than a way of showing you care. They’re a way for you to bond with your dog and provide mental stimulation. If you don’t know what kind of dog you want, check out breeds here. If you know which kind of pup you want, click here to get started looking for your new best friend.